and drawing their milk so that he can drink! than the weight of knowing his life is brief. nor who on the horizon hides the light. not pondering truths he can’t conceive. 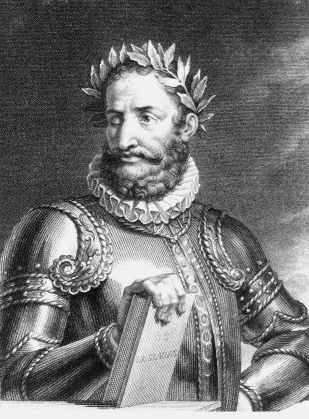 Luís Vaz de Camões (1524 - 1580) was a Portuguese poet whose penchant for romance and derring-do puts him right up there with Errol Flynn. An only child born to an aristocratic family and blessed with good looks, charm, education, and incessant joie de vivre, Luiz lacked one thing: restraint. Banished from Lisbon as a young man for a variety of infractions, he lost an eye in one early skirmish and went on to endure a lifelong maelstrom of royal favor, royal wrath, duels, debt, shipwrecks, imprisonment, love affairs and international intrigue--writing poetry all the while. Ultimately, he returned to Lisbon, where his poetry so pleased the king that Luiz was awarded a royal pension for the remainder of his life. This poet ended up in the Portuguese colony of Macao, where I lived for a while, and built a lovely garden there that still exists.